What do you get when you cross a socialist with someone who wants pity? Last week the freshman Congresswoman insisted that she did not have enough funds to get herself an apartment in Washington, D.C. until she gets her first paycheck. The facts determined, that was a lie, Fox News reported. Democratic Socialist Alexandria Ocasio-Cortez claims that she’s unable to afford an apartment in Washington, D.C., until she begins collecting her congressional salary, but records show she has more than enough to plunk down on an apartment in the U.S. capital. The 29-year-old congresswoman-elect rose to fame after she defeated 10-term incumbent Rep. Joe Crowley in New York’s June primary and was elected to represent the state’s 14th Congressional District last week. After months of fostering an image as a working-class Democrat, Ocasio-Cortez told the New York Times shortly after her Nov. 6 general election win that she won’t be able to afford an apartment in the Washington, D.C., area until her new $174,000-a-year salary kicks in next year. The median rent in D.C. is $2,700, according to real estate website Zillow. Most have taken Ocasio-Cortez’ claims at their face value, praising her for drawing attention to the housing crisis and that the electoral system is designed to discourage working-class people from running for Congress. But it appears that her claims of financial hardship collapse under further scrutiny, unless Ocasio-Cortez spent her savings like the 1 percent of the country and ended up cashless after the election. 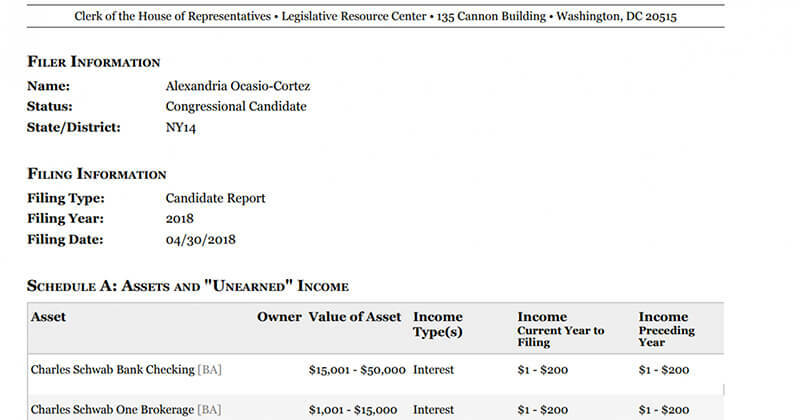 Ocasio-Cortez left her day job as a waitress at a New York bar mid-February and reportedly began living off her savings and her partner’s income in a one-bedroom apartment with an estimated rent of around $1,850 a month, so she could focus on her campaign against Crowley. She reported having between $15,001 and $50,000 in her checking account as of the end of April 2018, according to a Financial Disclosure Report she submitted to the clerk of the U.S. House of Representatives. The financial disclosure also reveals that she has an investment account valued between $1,001 and $15,000. his puts the socialist Democrat well above most American households, whose median checking account balance is $3,400, according to the latest Federal Reserve survey in 2016. Among Millennials, the median balance is about $1,400. This also means that for her not to afford an apartment in Washington, she should have depleted all her savings – as potentially ranging up to $50,000 – in just three months when she wasn’t receiving any income. Ocasio-Cortez didn’t earn any income up until August, when she began collecting a salary from the campaign, an option many political candidates take as they have to quit their day job for campaigning. She has taken $6,200 in salary from her campaign coffers since August. Her most recent check was for $1,288.96 in mid-October, just weeks before Election Day.